Tekniques offers our Guests 4 Levels of Stylist pricing based on Skill set, experience and customer demand. Every Haircut includes a full consultation, a relaxing scalp massage and a Styling blow dry finish. 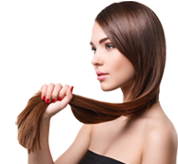 Our Stylists specialize in outstanding, innovative Hair Cutting. A quality haircut is the foundation of A GREAT Look! Our Goal is to achieve your ultimate look: We strategically cut your hair to flatter your facial features and bone structure. Extra attention is given to the condition, texture and "detailing" of the cut, which gives your hair life and character and ensures the wearability of the hair style. Custom tailored products complete the look post-cut. And no one leaves our salon without their stylists guidance and tips on how to easily achieve your look at home. Experience some of our services at Specialty Pricing with any of our New Talent Stylists....Call for More information. Every service we provide comes with a two week guarantee. If you decide you aren't happy for any reason, come back in and we will take care of it for you. Nobody else offers a guarantee like that!